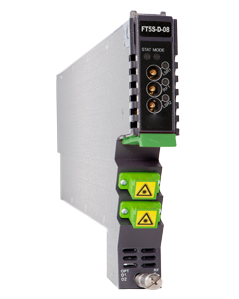 The 1550 nm Forward Transmitter Module - Standard series (FT5S) is designed to plug into PBN's latest generation Advanced Intelligent Multi-services Access platform - the AIMA3000. PBN’s AIMA3000 FT5S is available in single, dual laser configurations. It features advanced forward transmitters engineered for multi-service operators (MSOs) to increase network capacity to satisfy anever-growing subscriber demand for more bandwidth. The module’s operating wavelength conforms to ITU’s standards and works with PBN’s Erbium Doped Fiber Amplifier Module (EDFA). It allows for full-spectrum broadcast and narrowcast channels, providing the utmost flexibility for MSOs during the transition to all digital. The FT5S series employs an advanced RF circuit design and laser with high-quality and low-chirp characteristics. 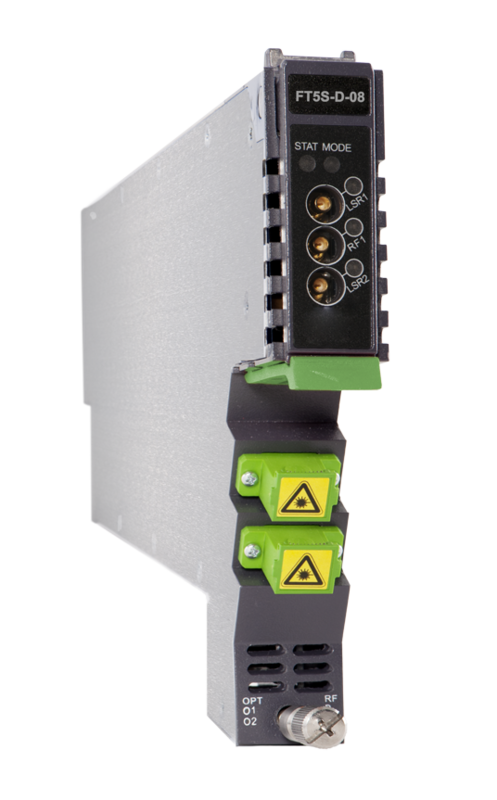 The module offers a consistent optical modulation index (OMI) and ensures high-index optical power output. In addition, it is a cutting-edge optoelectronic design for the delivery of high-quality transmissions, in both analog and digital formats over passive fiber optical networks. 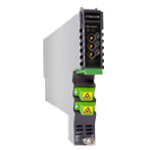 All FT5S models can also be conveniently monitored and controlled through a computer connected to one of the Ethernet ports via the ASMM module. All module settings are retained in non-volatile memory to ensure trouble-free operation. Bulk updating, automatic uploading and downloading of configuration files can be done when using PBN's NMSE web-based management system. (2) Three mini-SMBs on front panel: one each for BC and NC inputs and one to measure RF input before the laser transmitter. (3) Four mini-SMB connectors on front panel: Two NC inputs test ports and two to measure RF input before the laser transmitter. (4) Channel Loading: 30 NTSC + 117 channels QAM256 (ITU-T, J.83 Annex-A, 6dB below NTSC). All are measured with PBN referenced optical receiver with 5 km single-mode optical fiber 0 dBm. (1) Default spacing is 100 GHz. For other wavelength configurations not listed, please contact PBN. (2) X2 used only in dual transmitter versions. • Dual version, X1 is first channel and X2 is second channel. The third channel is 200 GHz higher from the second. Contact PBN Representatives for detailed optical channel information. (3) 1 GHz version only for single port models.